Is it possible to glimpse or foresee colors of the future? Will they be rosy, or golden, or perhaps drab? Predicting tomorrow's color trends is vitally important for the likes of fashion designers, cosmeticians, advertisers, furniture makers, dye manufacturers, and automobile companies. The problem, as the philosophical literature of India points out, is that the organ of sight "apprehends only the present color, neither past nor future colors" (Jadunath Sinha, Indian Psychology, 1986). Though we can't physically see future colors, through the corners of our eyes we might become aware of colors on the way out of vogue and spot the inklings of emerging fads. "Color forecasting," explains fashion expert Sue Jenkyn Jones, is a science for anticipating demands for color up to two years in advance of a retail sale season (Fashion Design, 2002). 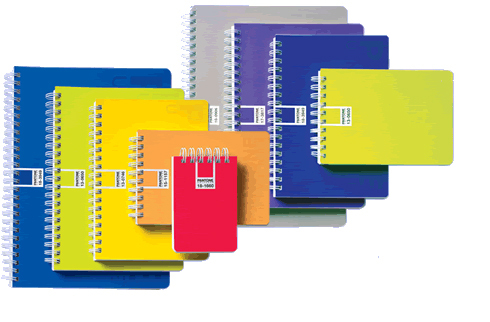 Color forecasters "collate information from all over the world on sales figures and changes in market interest in colors. They come together twice a year for conferences in Europe and the United States to summarize and define the broad industry trends." 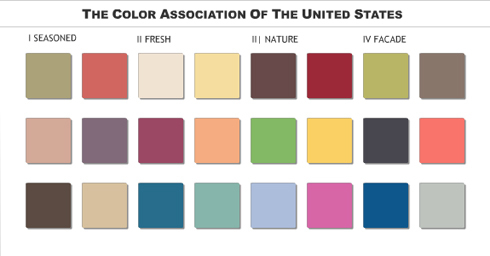 Jones notes that "the principal color advisory bodies are the British Textile Colour Group, the International Color Authority (ICA), the Color Association of the United States (CAUS) and the Color Marketing Group (CMG). In the process of analyzing data, the forecasters also observe and interpret the underlying social and cultural context and make projections for the future." 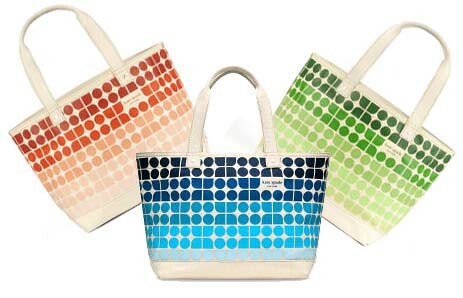 Jones offers an example from the 1990s, when environmentally-conscious consumers showed concern about chemical dyes. "Color forecasters warned the dye companies to concentrate on more natural shades and formulations. This provoked a return to the use of softer-colored 'natural' dyes and to the prevalence of undyed and unbleached materials in fashion." Meanwhile, notes textile expert Helen Goworek, "coolhunters" actively seek out "global influences on future trends by identifying individuals and groups within subcultures who have developed innovative styles of clothing" (Careers in Fashion and Textiles, 2006). Their data and predictions filter down to fashion designers, which helps to explain the similar colours and styles in competing stores. As the kitchen is essentially a creative place, use of colorful decor can only intensify the mood and give the room a vibe of powerful positivity. There are several ways to add color to your own kitchen, whether you choose to take the route of permanent change with paint or simply using colorful accessories for accent, it's all up to you! Pantone was founded in 1962 as a small business that manufactured color cards for cosmetics companies. Since their humble beginning, Pantone has become a mainstay for color in the design world. The Pantone Matching System allows colors to be "matched" when they reach the production stages. They also assert that their lists of color numbers and pigment values are the intellectual property of Pantone and free use of the list is not allowed, which is controversial and could be said to cause problems, especially for open source uses. Controversy aside, the world leader in color hasn't stopped with just their matching system and has started to move into taking over the 'universe' of color as well with the launch of Pantone Universe. Pantone Universe, Pantone's consumer product extension, "comes in color to match your personal taste and express your inner emotions." And since here at COLOURlovers we like our things to be, well, colorful, and since the Pantone Universe site is not that user friendly, we have put together a guide to some of their products. Pantone, and their off shoot of products has been a frequent subject here at COLOURlovers and we have previously covered some of the phones, bags, coffee mugs and art that make up the Pantone Universe, plus a fun post about Pantone Colors Found in Real Life. Notebooks, file folders and business card holders available here. "Express your personality and store your creations in style. These durable, aluminum design thumb drives allow you to store your digital photos, music files, business documents, and more on an ultra-small Hi-speed USB flash drive. 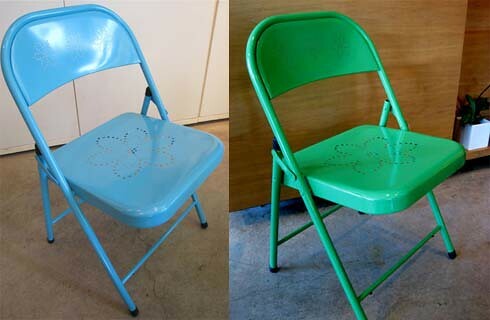 Available in 14 PANTONE Colors." Shop USB Drives. Coming soon from Pantone will be a line of basic office supplies like twin markers, colored pencils, staplers, and scissors. rainbow home with garish flashy colors and prints all over the place. I think the key is to have vibrant colors dispersed amongst more modest ones. We just moved into a new place and chose a dusty rose for the bedroom. I love it because my bedspread has a bright green butterfly pattern on a white background. Our livingroom/diningroom is an atmospheric blue that contrasts the warm wood tones of the floor and table. A brightly colored vase or cushions on the couch can accent any room. I go for the colors I love without trying too hard to match everything, and at the same time without going mad with bold colors everywhere. 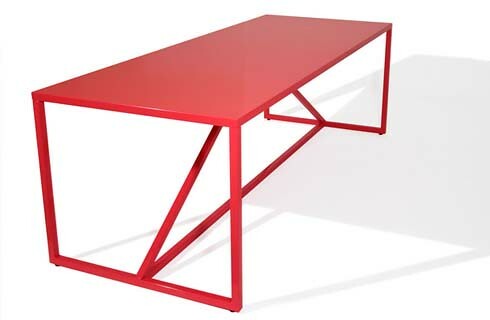 Here is some stunning furniture that would brighten up any room! 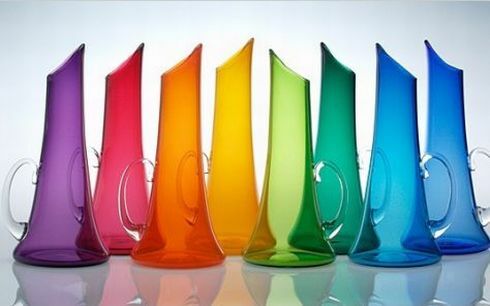 Each glass esque creation is hand-blown and will vary slightly from piece to piece. Each piece is a signed, unique, original, functional work of art. 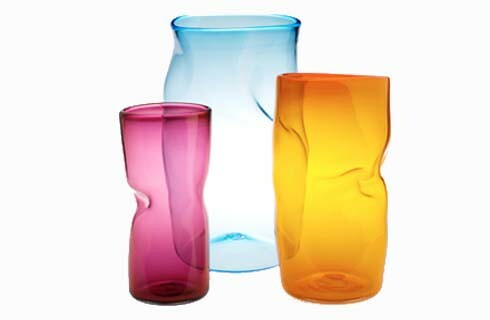 Esque glass is now all made with recycled glass stock; processed in an electric furnace that's powered by wind energy. 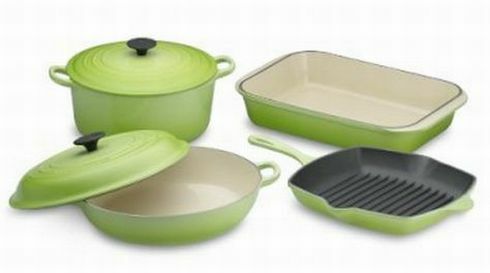 Another Velocity Green Product! Available in fuschia, orange, or extra light blue. 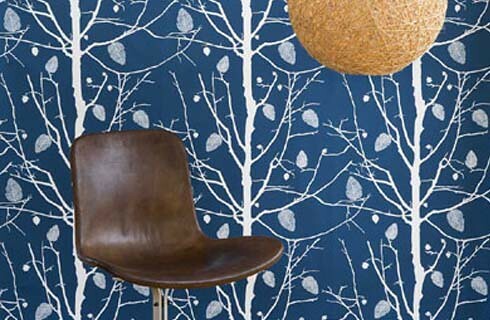 WallSmart is a new generation of non-woven wallpaper that is designed for easier and more flexible hanging by applying the paste directly to the wall. It is washable and has very good light resistance. It is designed in Denmark and manufactured in Sweden. 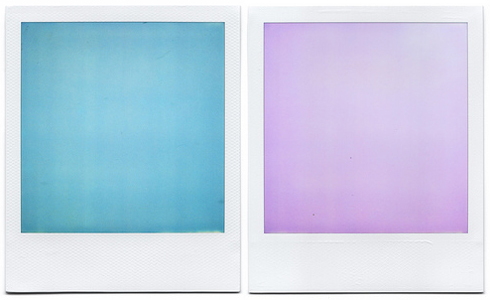 If you haven't heard, Polaroid film is dying. On February 8th, 2008, the Polaroid corporation announced that the incredible invention of Edwin Land has a permanent expiration date that no refrigeration can postponed; stating, "Polaroid has made the difficult decision to cease manufacturing of instant film products in 2008. We hope that you will continue to choose Polaroid products, as we take instant imaging into the digital platform with exciting new products being launched this year." The last of the film is projected to expire in September of 2009. It seems that there is still yet one hope remaining for Polaroid film. 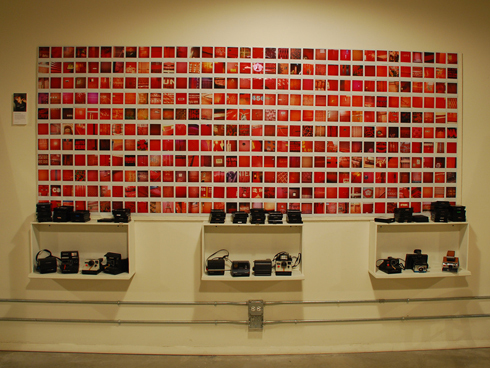 Save Polaroid has setup shop to assemble artists and fanatics to save Polaroid. On February 8, 2008, Polaroid Corporation announced that it will discontinue production of all instant film. This site will document the aftermath of this announcement and will serve as a home-base for the effort to convince another company to begin producing the cherished technology that Polaroid has so carelessly abandoned. This site is not about saving Polaroid, the company, rather the remarkable invention of Edwin Land, the instant film that made Polaroid a household name. Since this announcement, we’ve been assembling articles, links, stories and planning out the best way to create a joint effort to save instant film. We’ve contacted Polaroid, Fuji and Ilford about licensing. My good friend, and fellow member of the Chicago artist family The Post Family, artist Rod Hunting was asked by Save Polaroid to produce a limited run of his Polaroid print to be auctioned off on ebay to raise money for Save Polaroid. I sat down with Rod over some fine malt liquor to discus his 'Polareds' project, the end of Polaroid and speeding tickets. Colors, like people, tend to mix and mingle according to their inclinations. Sometimes two complementary HEXes will combine to create a new color. Sometimes two similar HEXes will merge to illuminate a more brilliant hue. Is it preposterous to label such unions as "straight" and "gay"? The ColourLovers library is full of colors with orientations identified in their titles. At a glance, can you tell a "straight" color from a "gay" one? Here's a three-part quiz, each more challenging than the last. In this first quiz, one column features colors with exclusively gay names. The other column features colors with exclusively straight names. Which is which? For the answer, click on any color to reveal the name. In honor of this month's release of the United States' redesigned five dollar bill I have been scouring through the 191 currently circulating currencies of the 192 member states of the United Nations to find some of the most colorful, unique and dramatic bank notes. The redesigned $5 bill was unveiled on September 20, 2007, and was issued on March 13, 2008. Previously covered here on COLOURlovers, the redesign involves some very noticeable changes, mostly for security reasons, but also in an attempt to make the bill more friendly to the visually impaired. The new five incorporates the use of micro printing of type to make it more difficult to copy. On the front, "FIVE DOLLARS" is written inside the left and right borders. "E PLURIBUS UNUM" is printed at the top of the shield. "USA" is between the columns of the shield and "USA FIVE" is printed on the edge of the most noticeable change, the giant purple "5". The giant purple "5". Yes, well, it was added to help those who are visually impaired but it may just leave more of us wishing that we were. Not that I necessarily dislike it, mostly I'm not too concerned with what the money looks like since I'm not collecting it for its aesthetic qualities, but a more reasonable choice, or at least a more colorful choice, would have been just to make the whole thing purple and start color coding all of the bills, much like many, if not most, other countries do. Maybe the Government doesn't want to get too far away from our 'greenback'. One Interesting thing about the new five is the use of the EURion constellation which many photocopiers will refuse to copy. This pattern, which is used for the series of little yellow "05"s, is used on many other currencies as well. Other changes to the bill include the increased use of water marks and an added security strip like those already used for higher denominations. Compared to those previous drab gray and green bills the US has made some colorful changes to the currency, but it is still nothing compared to the beautifully crafted and colored currencies of Venezuela, Switzerland, and Kyrgyzstan. The Bolívar Fuerte is the new currency of Venezuela since January 1, 2008. It replaced the old Bolívar which was the currency between 1879 and 2007. My personal favorite currency, it is a great example of the amazing bright and colorful notes that are seen throughout many South America countries. The Bolívar Fuerte includes illustrations of Francisco de Miranda, Pedro Camejo, Cacique Guaicaipuro, Luisa Cáceres de Arismendi, Simón Rodríguez and Simón Bolívar, on the fronts. On the backsides, the notes feature Amazon river dolphins, a giant armadillo, an American Harpy eagle, the hawks bill turtle, a spectacled bear and the red siskin. The spring 2008 color trends will include some of the brightest and boldest colors we have seen from the fashion world in a while. With New York Magazine titling their spring fashion issue, 'The Technicolor Season' and Pantone calling colors like Rococco Red and Freesia for the spring color forecast, recently reported here on COLOURlovers, this spring is set to be full of confident cheery colors. If you are set on keeping up with the latest color trends, then you may need not to look any further than We Love Colors. This hip online retailer carries tights in an astounding 45 colors. Their tights also come in multiple patterns like diamonds, checkers, vertical jagged striped, and for the really adventurous, splash color. There main line for women includes other things like dance wear and minidresses, but their products extend to socks, gloves, and ties, in addition to tights, for both children and men. To help you pick out your favorite color, whether it is neon pink, rust, or rubine, We Love Colors provides a guide to aide in sorting through their incredible selection of colors. 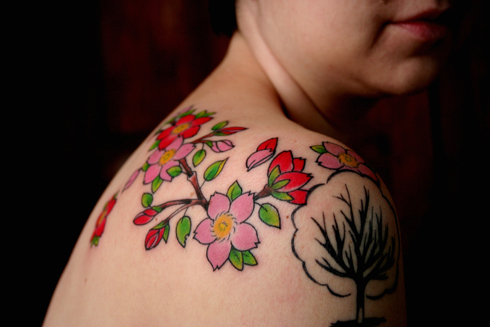 Colors inserted into the skin's dermis are known as tattoos or dermal pigmentation. A practice traced back to Neolithic times, tattooing remains popular worldwide for body decoration, initiatory rites, religious observance, love vows, and identification, to name but a handful of uses. Tattoo inks come in nearly unlimited variations, the most popular being red, green, yellow, blue, and white, which is used as a tint (source). Tattoo inks comprise of a variety of pigments in carrier solutions. The pigments may be organic-based, mineral-based, or plastic-based. The plastic-based pigments offer the most vibrant colors. "The inks used in tattoos and permanent makeup (also known as micropigmentation) and the pigments in these inks are subject to FDA regulation as cosmetics and color additives. However, the FDA has not attempted to regulate the use of tattoo inks and the pigments used in them and does not control the actual practice of tattooing. Rather, such matters have been handled through local laws and by local jurisdictions. . . . Although a number of color additives are approved for use in cosmetics, none is approved for injection into the skin. 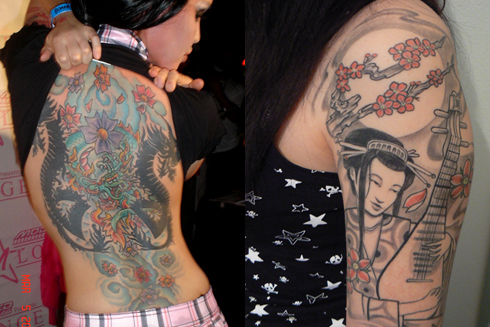 Using an unapproved color additive in a tattoo ink makes the ink adulterated. 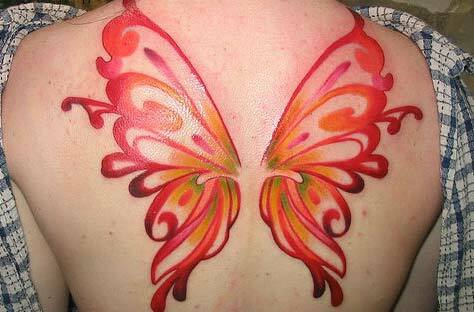 Many pigments used in tattoo inks are not approved for skin contact at all. Some are industrial grade colors that are suitable for printers' ink or automobile paint" (source). Color has always been an important component of fashion whether it be a heather grey or crimson red. Each designer makes color choices that will be indicative of their aesthetic, season, and era. Lately, I've been seeing beautiful and rich color choices in the fashion and accessory world. It seems that everyone is becoming obsessed with Pantone gradations. 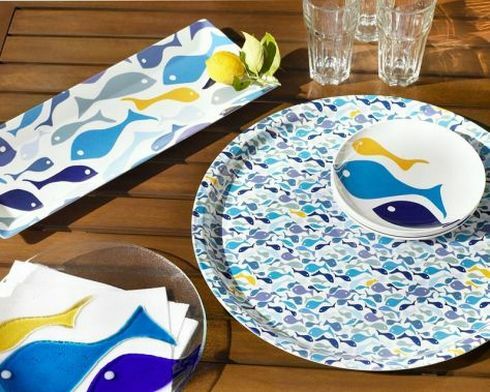 Check out some of my favorite examples of some stunningly colorful products as well as Pantone's Spring color predictions.